December 25th we decided to explore the Balat district in Istanbul. This district used to be a stronghold for the Jewish and Greek minority in the Ottoman empire. There were, to our surprise, very little left of these cultures in the area. One of the oldest remains from the Jewish community is the Ahrida Synagogue built around 550 years ago. 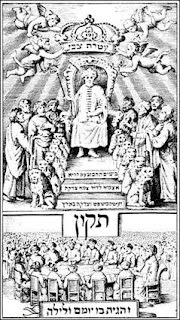 We know very little of the conditions of the Jewish community during the Byzantine era. It does seem to have lived in relative peace, escaping any pogroms like those regularly conducted at the communities in Western Europe. As the Ottomans invaded Constantinople in 1453 much changed for the Jewish community. Sultan Mehmet II started the following years a giant reconstruction of the city. He issued a decree that ordered Jews living in the conquered territory to move to Istanbul. This mass exodus of Romaniote Jews from the Balkans, Anatolia and Greece increased the amount of Jews in Istanbul to 10% of the total population. This exodus was further strengthened by a smaller Ashkenazi Jewish group from Western Europe escaping persecution between that immigrated between 1421-1453. This mass movement was, however, not perceived as an anti-Jewish measure, and they have continued to live in relative peace in the country until the present day. As we sat on the ferry up the Golden Horn, we hoped to get access to this ancient synagogue. When arriving we discovered, sadly that it was closed. As we studied our guide book, we discovered that visit was by appointment only. We saw the brightly coloured, heavily protected gate with the inscription. The Ahrida Synagogue (Hebrew: אכרידה‎) was built around 1450 by Jews from the city of Ohrid in present Republic of Macedonia. They were Sephardic Jews, originating from the Iberian peninsula and ordered to leave when the Christians chased the Muslims out of today's Spain and Portugal. 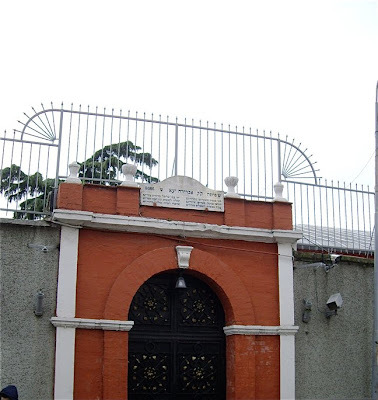 It is the only Synagogue where Sabbatai Zevi (Hebrew: שַׁבְּתַי צְבִי), a famous teacher and kabbalist and founder of the Sabbatean movement and proclaimed as the Messiah by Nathan of Gaza in 1665. He later converted to Islam. 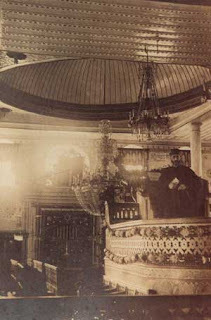 The synagogue was completely renovated in 1992, and its most characteristic feature is the boat-shaped tevah (reading platform) . For those of you that want to see the interior of this remarkable building, consult your guide book, and make an appointment. I will most certainly do so, when revisiting Istanbul - and I will, soon! !